Adult Leaders are needed for delegations traveling to Village, Interchnage, Step Up, and Youth Meetings with participants under 16. Most CISV programs are designed for the children, but they also provide very educational, enlightening experience for the adults. Adult leaders play a key role in Village, Interchange, and Summer Camp. In a Village, the team of leaders, along with the junior counselors, carry out the day to day program of the camp, planning the activities and shaping the experience for the 11 year old participants. In a Step Up Camp, the leader’s role is more akin to that of a facilitator, as the participants themselves plan the camp’s activities with the guidance of the adult leaders. During an Interchange, the leader collaborates with the parents and delegates to plan out a group schedule and activities, while also hosting the delegation leader from the partner country. 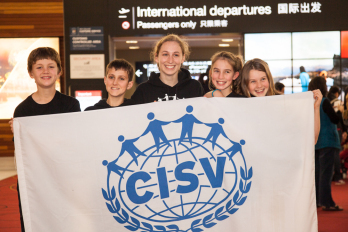 Adult volunteers in a CISV activity should not expect a vacation, but to work eighteen hours a day for the duration of the program. Leaders do get time off from the camp so they can spend a day off-site, exploring the local community, and in the Village program, the middle weekend of the month allows the leaders to get some relaxation time together as a group while the children stay with host families.